AN enthusiastic crowd of ALP supporters packed into St Kilda’s Hotel Esplanade for the launch of Josh Burns’ bid to keep Macnamara in Labor hands. Michael Danby has reflected on his 20 years in politics as he delivered his valedictory speech to Federal Parliament. Labor's Josh Burns, Liberal Kate Ashmor and the Greens' Steph Hodgins-May addressed a raft of issues at the Great Debate for Macnamara last Sunday. MOUNT Scopus College's dream of moving the entire school to Caulfield could be confirmed within 18 months. 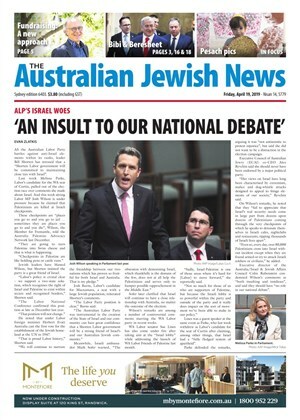 JEWISH leaders have voiced concern over reports that a vote in Western Australia could become the next stage in a creeping move within the ALP to grant unconditional recognition to a Palestinian state. AS a famous Jewish broadcaster might have said, let’s tell it like it is. The war for Israel is being lost. It’s being lost in branch meetings and conferences and membership numbers and political parties across the world; it’s being lost on cable news and in university classrooms and in Facebook threads and on Twitter posts and in arguments around a million tables in a million cities. 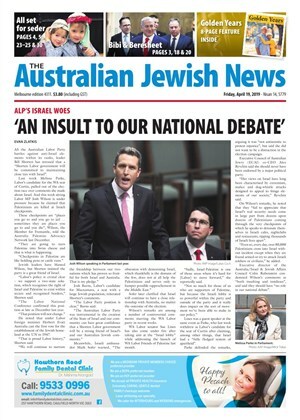 IT’S a long way from Cairns to Jerusalem, but the distance is shrinking, at least metaphorically, thanks to a group of Indigenous Australians who are committed to seeking justice for Israel in the harsh courts of international public opinion.